A whole, un-circle-cut Mexican Sage geranium indicates that the leafcutter bees have found more suitable materials for nest building. I’m keeping my fingers crossed, anyway. They are now carving up the leaves of the Scentimental rose and Victoria sage. That will be just fine. I’ve been thinking about this a lot and have developed a strategy to deal with these so-called beneficial insects. 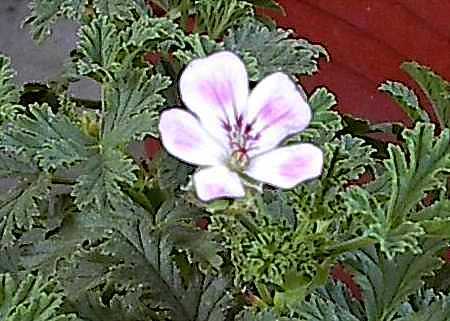 At the first sign of a leafcutter bee attack on the scented geranium flowers, I’m going to sit there and wait by their chosen target, knock them down with a spray of soapy water, and then squash them with a flip-flop.